Write a Java program to check whether a number is a Pronic Number or Heteromecic Number or not. A pronic number is a number which is the product of two consecutive integers, that is, a number of the form n(n + 1). 0, 2, 6, 12, 20, 30, 42, 56, 72, 90, 110, 132, 156, 182, 210, 240, 272, 306, 342, 380, 420, 462 … etc. Previous: Write a Java program to check whether a number is a Harshad Number or not. 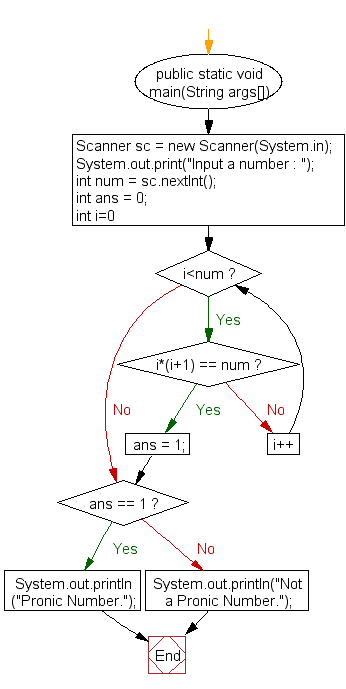 Next: Write a Java program check whether a number is an Automorphic number or not.